Paintball has grown in popularity our the years as great activity for a stag party. It will enable those who the best man has actually remembered to invite, to shoot each other in the face. Let’s face it, before your friend gets married he’s going to want to shoot somebody and since the broad with the ever increasing grip upon both his wallet and testicles will not be on hand he’ll just have to settle for the next best thing, a group of his closest friends and a couple of people he’s never met before because you needed to make up the numbers. Here’s an idea that is perfect to dress the stag up as. Deck him out in a paintball outfit either clad in a Bin Laden costume or perhaps the Taliban costume and batter him with a barrage of shots. What could be more fun than to single out the stag and cover him in a combination of bruises, paint and shame? It’ll be a little like Leslie Grantham after a night out. Perhaps you’d like to opt for two entire teams of terrorists. How about you kit out one of the teams in a Somali pirate costume and the other in IRA fancy dress. Think how great the photos would be. The cowboy and Indian fancy dress theme is great for paintballing as it recreates that childhood game that we all will have played, well, unless you happen to be a Jehovahs witness. I once went to visit my friend and I wasn’t allowed in his house because I had cowboy guns and holsters. Now, I’m aware that plastic revolvers could be very dangerous, for example there could be a burr of plastic on one of the triggers which could lead to a scratch on the fore finger. Anyway, I digress. Picture in your head, if you will. 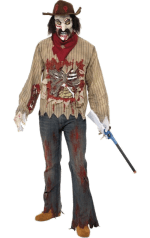 A team fully furnished in an undead zombie cowboy costume. Standing ready to enter battle. No need for warpaint, no need for a hakka style ritual. The zombies go into battle and absolutely destroy the opponents as an army of undead. How cool is that. Not even a naked Leslie Grantham would deter the utter desolation of this brain munching war machine. Cowboys and Indians costumes are popular, look great and would make a welcome addition to the battlefield. Be sure to take a look at the range of Red Indian costumes that are available today to offset the dramatic cowboy fancy dress costumes. This one may seem obvious, but, if you want to get serious about paintball there are some great army fancy dress costumes that will make you seriously look the part. If you are planning to blend in with the trees and shrubbery in a woodsball environment, what I am about to share will absolutely make you blend into your surroundings and hide you like an armed chameleon and are examples of the best paintball costume for the job. 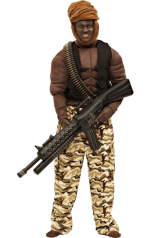 The Army Soldier costume is a simple paintball costume that is crafted in woodland colours, it leaves your face clear and unimpeded and even comes with functioning pockets to allow you to store items in. We recommend a Peperami in the event you get hungry. Don’t remove your mask though, you’ll end up looking like Columbo afterwards. Fancy leading your team out in classic Homeguard colours? Take a peek at the Dads Army costume, it is made from a comfortable polyester and is available in two sizes. If you are going to organise an event where everyone has to source their own paintball costumes then you will need to try and find something original yet, also embraces the fact that you are shooting at each other with a paintball marker. 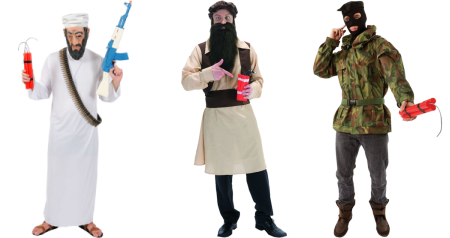 So, below are our top five fancy dress costumes that you could replace their weapon with a marker and destroy the competition as. You’ll notice that each paintball outfit suggestion above uses some form of weapon. This was the distinction that led us to our decision. Do you think we have missed any or do you have a better suggestion? Let us know.